Thomas Coke is one of the founders of the Methodist Church in the United States. He worked along side John Wesley who regarded Coke as his right-hand-man. The two worked together for a number of years. This commentary is still considered a must-have for Methodist and Wesleyan pastors. And it's an interesting reference for other denominations, especially if you like Wesley's commentary. Volume 1: Genesis to Deuteronomy, 1801. Volume 2: Joshua to Job, 1801. Volume 3: Psalms to Isaiah, 1802. Volume 4: Jeremiah to Malachi, 1803. Volume 5: Matthew to Acts, 1803. Volume 6: Romans to Revelation, 1803. Though remembered primarily as the "Father of Methodist Missions," he was a key figure in the development of Methodism on both sides of the Atlantic in the years before and after Wesley's death. As Wesley's right hand man, he became President of the Methodist Church in Ireland in 1782, and two years later was appointed "Bishop" for America. 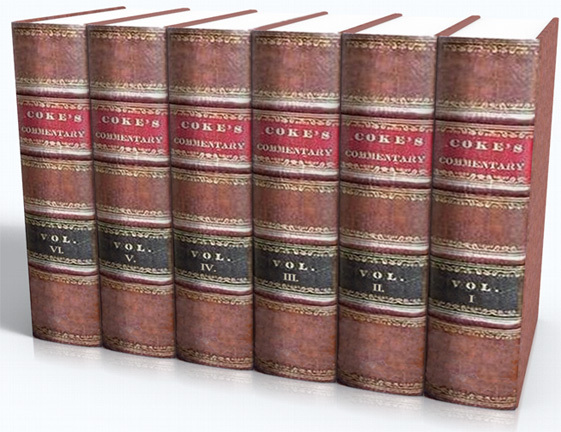 As Asbury's uneasily yoked colleague, Coke visited America nine times, the last time in 1803. Always deeply interested in missionary work at home and abroad, he traveled widely to establish Methodism in the West Indies. Hoping to open Methodist missions in the East Indies, in 1814 he set sail for Ceylon, but died on the way. This relatively large commentary (37 megabytes) contains over 13,330+ passage comments and nearly one thousand chapter comments. Coke discusses 2,413 Greek words and 2,348 Hebrew words. Nearly every verse in the Bible includes a comment. Fixes to the e-Sword edition, from the text provided to me, is: Chapter comments separated from verse comments, roman numeral verse references converted to arabic digits, and Greek/Hebrew distinguished from English text for proper display. The last verse comment of some chapters sometimes contains reflections on the whole chapter.